Winemaker Adam Tolmach discusses making Syrah from vineyards on California’s Central Coast. Paso Robles, Calif.—California’s Central Coast Syrah represents a diverse tonal range of grapegrowing locations, from cool-climate sites like the Santa Maria Valley’s Bien Nacido Vineyard to sandy ones like Jonata Vineyard to rocky ones like Paso Robles’ James Berry Vineyard. The Central Coast has long championed Syrah, and winemaker Adam Tolmach is one of its pioneers, having planted The Ojai Vineyard in 1983 to Syrah and Sauvignon Blanc. 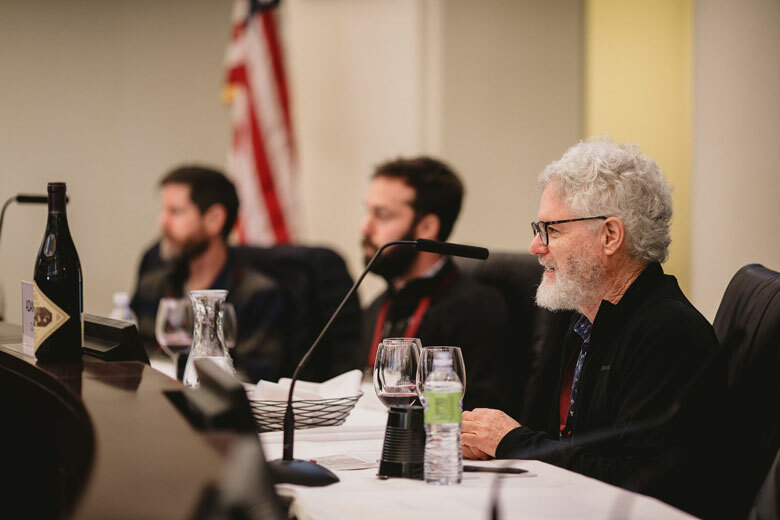 Tolmach shared his 2014 Ojai Vineyard Bien Nacido Z Block Syrah (released at $45; 374 cases) at the recent Wine Speak Paso Robles conference, describing it as a cool-climate manifestation of the variety. An advocate for diversifying approaches to Syrah, Tolmach described how, in his early years at The Ojai Vineyard, he subscribed to the prevailing trellising system of the day, California sprawl, as well as sprinkler irrigation, which took too long to bring Syrah to ripeness. When he eventually adapted to vertical trellising and drip irrigation, the low-crop, highly trained vines produced unchecked sugars out of all proportion with the Crozes-Hermitage style he sought to emulate. Tolmach proceeded to rein in the ripeness by introducing whole-cluster fermentation (15% whole cluster on the 2014 Bien Nacido Syrah, though he approaches 75% on other warmer climate Syrahs), picking earlier and sourcing fruit from other cool-climate sites like Bien Nacido Vineyard. Unlike most of Santa Barbara County’s Ballard Canyon AVA, the land at Jonata Vineyard is predominantly sand?an unusual soil choice for Syrah, but one that paid off. “Syrah grew perfectly in Ballard Canyon,” said Jonata winemaker, Matt Dees, who joined the winery in 2004. “All these 14 vintages later, it’s never failed.” He noted that other successfully sandy Syrahs of the world include Australia’s McLaren Vale and vineyards around Châteauneuf-du-Pape. The sister winery to Napa Valley’s Screaming Eagle (both are owned by mogul Stan Kroenke), Jonata continues to take an experimental approach to growing and vinifying Syrah, adjusting pick date, tinkering with whole-cluster fermentation and oak exposure, and blending in a judicious quantity of Viognier. At Wine Speak, Dees shared Jonata’s 2010 “La Sangre de Jonata” Syrah (570 cases released in 2013 at $125 per bottle), 15% whole-cluster fermented, aged on 25% new oak and blended with 4% Viognier. On Paso Robles’ West Side, in the Willow Creek District AVA, Saxum winemaker Justin Smith sources estate Syrah from his family’s James Berry Vineyard (among others), which his father planted to Mourvedre in 1980 and Syrah in 1990. At Wine Speak, Smith shared the 2008 Bone Rock Syrah ($85 upon release in 2010; 312 cases) from a terraced, south-facing block of old head-trained vines. Admitting that he didn’t set out to make a great Syrah, but rather “to make the best possible wine I could from my family’s vineyard,” Smith quickly discovered that Syrah wasn’t physiologically ripe at 24º or 24.5º Brix. At James Berry Vineyard, it took much longer hang time to achieve ripeness and softer tannins, resulting in a rich, plush style. To add complexity, depth and minerality of lighter northern Rhone-style Syrah, Smith started playing with whole-cluster fermentation as well as maceration in concrete. For his 2008 Bone Rock Syrah, the juice spent 53 days on skins and fermented with 60% whole clusters; sugars were at higher than 28º Brix, and acidity was 3.4. “We’re just getting our ripeness parameters at higher Brix,” he said. For Tolmach, “climate trumps everything,” and for Dees, sandy soils are the hallmark of Jonata Syrah. For Smith, the heart of his wines lies in limestone. Smith said that his vineyard’s rocky, sedimentary soils act like a wick on a candle, passing water from deep in the ground up to the vine’s roots, and allowing him to dry-farm most years. “Once the roots get into this rock, they’re getting fed with water from last year or, who knows, maybe a thousand years ago. That helps to moderate things,” he said. Later, Smith, whose wines repeatedly garner high scores and whose scarcity continually taunts buyers, considered Furuya’s question: What is the state of Central Coast Syrah?